Mike Ullery | Daily Call City of Piqua employee Logan Fessler sets up a protective barrier in the Hydraulic Canal near Ziegler Road on Wednesday afternoon following a hydraulic fluid leak after a line broke on a tractor that was mowing along the bike path. Several gallons is reported to have leaked from the broken line. Absorb-ant pads and barriers were quickly set up to contain the spill. The Ohio EPA was contacted about the incident. City of Piqua employee Logan Fessler sets up a protective barrier in the Hydraulic Canal near Ziegler Road on Wednesday afternoon following a hydraulic fluid leak after a line broke on a tractor that was mowing along the bike path. Several gallons is reported to have leaked from the broken line. Absorb-ant pads and barriers were quickly set up to contain the spill. The Ohio EPA was contacted about the incident. 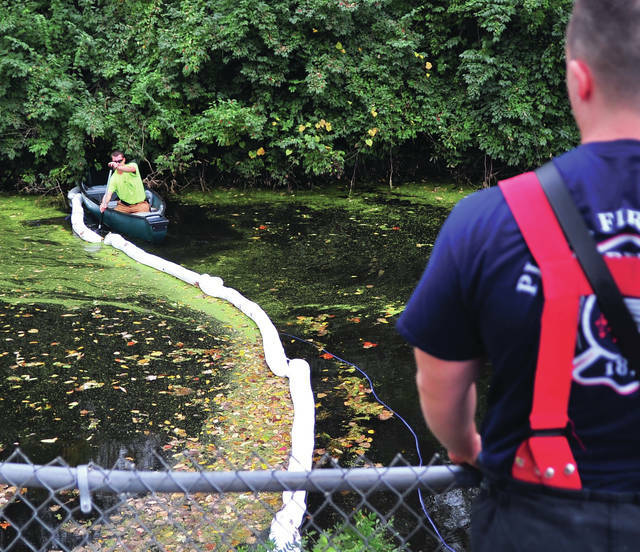 https://www.dailycall.com/wp-content/uploads/sites/30/2018/10/web1_101018mju_piqua_hydraulicspill.jpgMike Ullery | Daily Call City of Piqua employee Logan Fessler sets up a protective barrier in the Hydraulic Canal near Ziegler Road on Wednesday afternoon following a hydraulic fluid leak after a line broke on a tractor that was mowing along the bike path. Several gallons is reported to have leaked from the broken line. Absorb-ant pads and barriers were quickly set up to contain the spill. The Ohio EPA was contacted about the incident.